On the corner of New and York Streets in Richmond, between small Victorian units and new apartments, amongst a tangle of graffiti art on nearby walls, and set behind a garage roller door, lies New York Tomato. Unfortunately when I visited New York Tomato on a chilly Tuesday morning, the weather made it impossible to utilise the courtyard, lined with wooden slats and matching plant boxes with small shrubs peeking over the top. But on warmer days one can easily visualise the space packed full of people munching and sipping away, removed but not far from the bustle of the busy main roads just a few streets away in all directions. A top spot for workers and socialites alike. Upon stepping inside, the few tables and minute kitchen only prove that 'size doesn't matter.' However just two small flights of stairs away is a cosy room that is somewhere between a warehouse and a living room. With a familiar, homemade feel, red wine coloured drapes are a simple yet effective way to cover the ceiling, although this rough-around-the-edges atmosphere is treasured rather than tested. Try to nab one of the comfortable corner tables with the couches if you plan on sitting there for hours, which you easily could! Each breakfast meal comes served on a wooden board and includes everything from toast to Mediterranean delights. For those with sweet teeth, sample the Belgian waffles with spiced sesame labna, banana, cinnamon roast pear and orange blossom maple syrup. Or perhaps for something more savory, the Middle Eastern baked eggs with roast peppers, chick peas, haloumi, pomegranate, coriander and sumac. 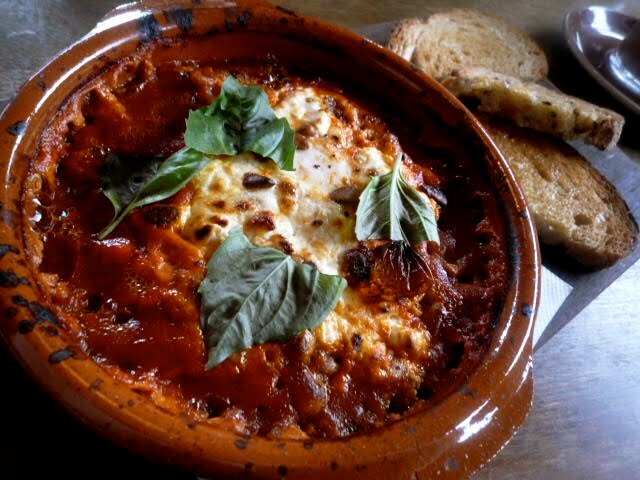 I indulged in a breakfast claypot consisting of free range eggs, goats cheese, basil and pine nuts, all baked in napoli sauce with a side of toast. Decently priced for a more gourmet breakfast and rich in character, New York Tomato gets 4 kisses. I'll see you back there for lunch. Hi Sofia, loving your writing...keep some of those reviews for ronnies-spots!